Living in Miami is never more amazing than during the holiday season. There are so many things to do; some of the best shopping in the world can be found here, the best restaurants to celebrate with your family and your closest friends, countless outdoors activities to do with your children and your relatives, and the best part is the Caribbean Sea flooding every corner of the city with a unique tropical atmosphere that will help you relax and enjoy life a little bit more. You will never forget a Christmas in Miami! 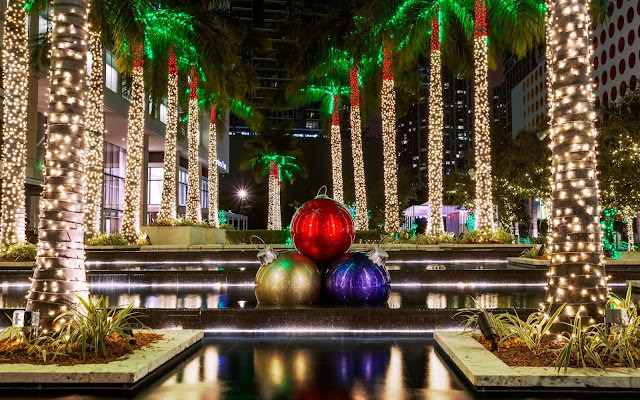 For many, Christmas means winter, cold, gathering around the fire, and snow, but every year more and more Americans (and foreigners) decide to visit Miami during this season to have a little taste of how Floridians celebrate these festivities. Miami is many things, but boring isn’t one of them. Maybe it’s the beach, maybe it’s the Latin influence, maybe it’s because of its history that Miami is such an amazing city, and this 2017’s Christmas season promises to be the best in many years. Whether you are living in Miami or just visiting, there are some activities that you simply can’t miss this December. -From December 7-10, if you are an art lover, you’ll enjoy the Miami Art Week. There will be events and fairs held all over town where artists from all around the world exhibit their pieces. And the main event: The Art Basel Miami Beach, where you can actually buy some pieces for your collection or enjoy watching the work of painters, sculptors and other visual artists. -If you are a music lover then you can’t miss the Sounds of the Season with the New World Symphony this December 16. A wonderful concert at SoundScape Park at the New World Center in Miami Beach to celebrate the beginning of the holidays with the whole family. -Enjoy an all-time classic, The Nutcracker. There’s nothing like a Christmassy play to really turn your holiday spirit on. You can catch a show in different venues throughout December (1-31): Adrienne Arsht Center for the Performing Arts of Miami-Dade County; The Fillmore, Miami Beach; South Miami-Dade Cultural Arts Center; or the Aventura Arts & Cultural Center. -One of our favorites, Santa’s Enchanted Forest(December 1-31). This is the largest holiday theme park in the world. A 92-foot tall Christmas tree, carnival rides, shows, fun games for the whole family, delicious food and the Christmassy aura that will get you exactly in the mood to enjoy this season like never before. Also Christmas trees all over town, decorations, special menus at restaurants, special season sales in the best stores, a cool weather, live Christmas-themed music presentations all over town, and happy people all around anxiously waiting for the big day. Get ready, the holidays are almost here!